I know there’s still time left in 2012 for people to write great posts on local SEO…but it’s gonna be hard to top the crème de la crème. Much like one of those snore-fest radio countdowns, I’ve picked what I consider the 10 best posts of the year. Except my picks are exciting and useful…and I’m not counting down (or up)…and I’m not a DJ. What I love about these posts is they can help you no matter how much or little you know about local search. 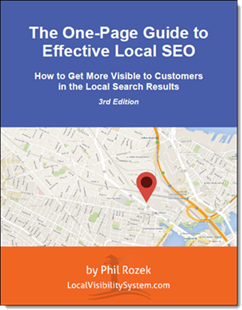 Many of them deal with tough topics but do a magnificent job of breaking it all down into insights or steps you can easily apply to get your business more visible in the local rankings. As you can see, I don’t include my own posts – as was the case on the only two occasions I’ve done roundups so far. Enjoy, bookmark, apply…and grab some better local visibility. What do you like about these posts? Any words of appreciation for the authors? Leave a comment! Hey Phil, great list and thanks for including one of my posts. There has been so much awesome info posted this year. Well, it’s a unique honor to be listed on ‘The Count’s’ roundup of best local SEO posts of 2012. And, you know, I totally missed Matt’s title tag post. Got to go read that. Great list and thank you for the kind mention. Thanks for stopping by, Miriam! Glad you like the Count – though I wish I could have found a picture of him with the number 10. Matt’s post on title tags was a keeper, all right – a bright spot among a bunch of drivel that other people have written on title tags. Thanks for arranging a best of list. Definitely a must read list for ANY small business owner! I’m a vet who is also a competitor, so I don’t think I will take you up on this, but it’s great to see. And many thanks for your service as a Vet. I don’t consider anyone to be my “competitor,” so please feel completely free to take me up on the offer.